Although we are a Mardi Gras Krewe, we have events throughout the year. Please join us at one of our upcoming events! Our annual Gras Fest in Defuniak Springs is always filled with food, crafts and curiosities, and classic cars. 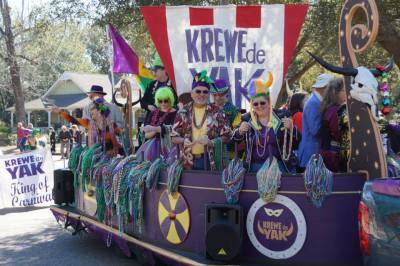 The highlight of the day is our annual Mardi Gras parade, with floats from all over the area. Afterwards, the fun continues at the after-party at 4C's Barbeque, with live music and great food. This event is fun for the whole family - so come out and Let the Good Times Roll with Krewe de Yak! 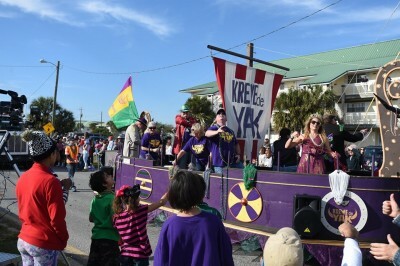 Want to find out more about Krewe de Yak? Join us for our Monthly Meeting! Meetings are held the second Thursday of each month at 6pm. Call (850)419-5977 or email [email protected] for the location, as we rotate between several local restaurants. "Play hard, be happy, and help those in need"